Tenor Allan Clayton joined Ian Page and the Orchestra of Classical Opera for a concert celebrating the tenor John Beard (for whom Handel wrote the title roles in Jephtha and Samson) at the Wigmore Hall last year (see my review). They also went into the recording studio and this new disc from Signum Records is the fruit, a recital of music sung by or written for John Beard (c1715-1791). The bulk of the items are by Handel with arias from Esther, Il pastor fido, Ariodante, Alcina, Alexander's Feast, Berenice, L'Allegro, Solomon, Samson, Judas Macabaeus, Jephtha and Semele, but we also get items from JC Smith's The Fairies, and Thomas Arne's Artaxerxes. Beard was trained at the Chapel Royal, but clearly had a notable voice as at the age of 19 he went straight from the Chapel Royal to singing in Handel's Il pastor fido and sang for Handel until the composer's death. His dramatic talents were such that Handel would write the title role in Samson for Beard at a time when tenors were usually relegated to fathers, generals or villains. The title role in Jephtha would follow, as would Septimus in Theodora. But there was a gap in this long relationship, we are not sure why; perhaps a falling out, perhaps Beard was too busy with his career singing songs in theatres like Drury Lane or Covent Garden. But in the final years of Handel's life Beard was his tenor of choice, singing not just in Jephtha and Theodora, but in revivals of many of the other oratorios. 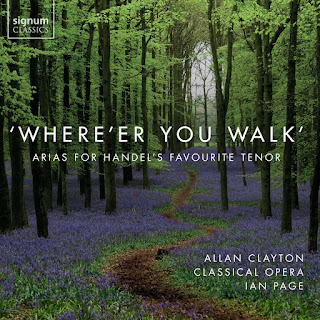 This disc from Allan Clayton, Ian Page and the Orchestra of Classical Opera takes us on an historical survey of the works Handel sung by Beard from Esther in which he sang whilst still at the Chapel Royal (and may well be the work which brought him to Handel's notice), to Jephtha the final work which Handel wrote for him. This is quite a range, the roles cover works nowadays often sung by dramatic tenors such as Samson as well as lyric ones such as Jupiter in Semele and the tenor role in L'Allegro. Allan Clayton has just the right combination of suaveness and robustness to do justice to the whole range of roles. He is convincingly brilliant in the Italian roles, including a beautifully intimate Un momento di contento from Alcinia. But has the right strength of focus for Samson's Thus when the sun from's wat'ry bed, though I would have loved to have heard Clayton singing Samson's Total Eclipse. Clayton also has a fine trill, and as suave a line as you could ever want in arias like Jupiter's Where'er up walk from Semele. For two of the items Clayton is joined by soprano Mary Bevan including one of the highlights of the disc, the duet As steals the morn from Handel's L'Allegro. The CD booklet includes an extensive article by David Vickers, along with notes on all the music by Ian Page, giving full background. Ian Page and the Orchestra of Classical Opera provide admirable support, proving as versatile as Allan Clayton in the wide variety of music. We also get to hear them on their own, in the sinfonia from Act Two of Handel's Alcina, and the sinfonia to Act Two of Boyce's Solomon. This disc can be listened to in two different ways. 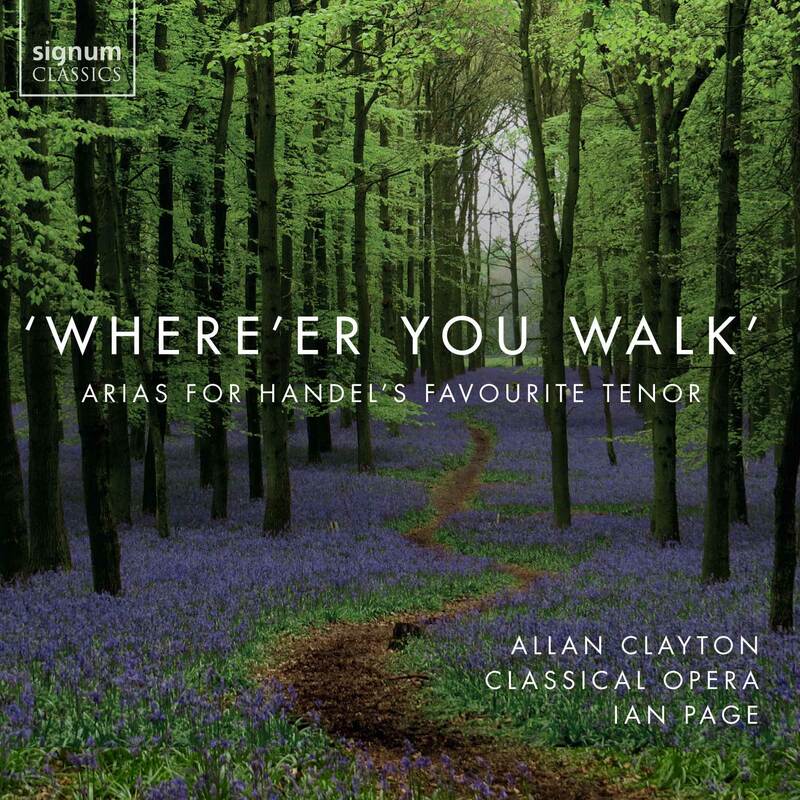 On the one hand it is a fine recital of arias by Handel and his contemporaries, in which Allan Clayton shows his admirable skill and charm in a wide variety of Handel's music. Viewed like this, you may prefer a lighter, more lyric tenor such as Mark Padmore. Padmore covers similar ground in his disc As steals the morn... albeit with a rather different style voice to Clayton's and I have to confess that I prefer Clayton's more robust, and theatrical approach, you sense that his performance of the more dramatic works would really pack some punch in the theatre. On the other hand it is a fascinating historical discourse, taking us on a voyage through the music written for John Beard, and giving us something of a picture of his voice and personality. It says much for Allan Clayton that he can fill the role admirably.